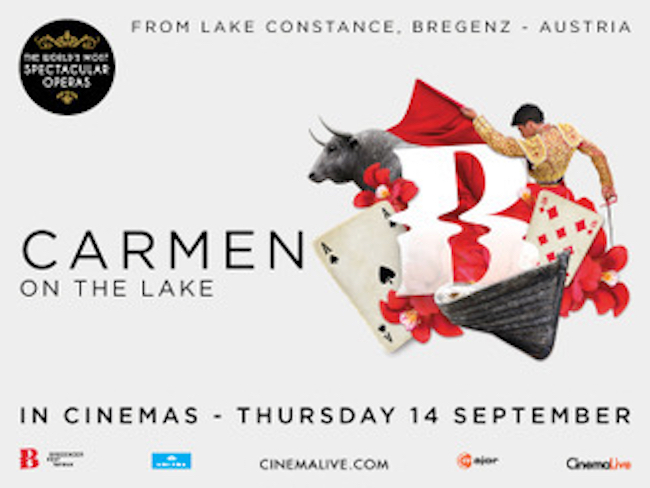 Event Cinema specialists CinemaLive are pleased to announce they are working in partnership with C-Major Entertainment to bring George Bizet’s Carmen on the Lake (Bregenz, Austria) to close to 300 cinemas in the UK on Thursday 14th September. 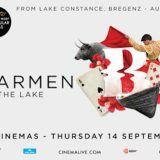 This will be a uniquely staged spectacle under CinemaLive’s recently launched brand The World’s Most Spectacular Operas that showcases stunning operas from around the globe in cinemas, making them accessible to UK audiences. Seebühne (or floating stage), with its 7,000 seat open-air amphitheatre, is the location for the French composers most successful opera. With a set designed by British artist Es Devlin, who has designed sets for stars such as Adele, U2, Take That and Kanye West, the stage sits on the water near the shores of the stunning Lake Constance in Austria. This romantic and dramatic setting regularly welcomes opera lovers from all over the world, where the productions are extravagantly original and innovative and frequently use the waters of the lake as an extension of the stage. Georges Bizet’s captivating music, with its instantly recognisable Spanish sounds is known to one and all. Music directors Paolo Carignani and Jordan de Souza will lead the musical direction of this production, with the Bregenz Festival Chorus and Prague Philharmonic Choir accompanied by the Vienna Symphony Orchestra. For the past 5 years, CinemaLive have distributed Opera Australia’s Handa Opera on Sydney Harbour productions to cinema audiences in the UK & Ireland. These productions have now been seen by over 75,000 people on the big screen. Productions have included Madama Butterfly, Turandot and Aida (which in 2015 broke the UK & Irish box office record to become the highest grossing recorded opera of all time).